Tri-Sate Laboratories, Inc. (TSL) was established in October of 1978 initially as a forensic laboratory. Soon it was realized that there was a need for environmental services as such the facilities were expanded to help the industry in the compliance of new federal and state regulations. TSL expanded to accommodate new services and moved its operation twice since 1981. Current new facility at 2870 Salt-Springs Road, Youngstown, Ohio 44509 was specifically built for TSL in 1993. 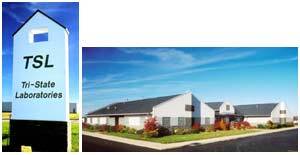 In the year 2000, TSL acquired Environmental Control Labs (EC Labs) in the Cleveland area. This provided the corporation an additional facility in Northeast Ohio. The number of employees has varied between 30-42. Employees are professionally qualified through experience and academic degrees. Key people in the company have national certifications and membership in the professional societies. Very important fact, which distinguishes TSL from most other labs, is the expertise and professional qualifications of the personnel to withstand the scrutiny of legal and scientific challenges. While new labs have come and gone, some have changed their names every few years, TSL has proudly maintained its reputation and have continued to expand. Tri-State Labs, Inc. is certified MBE/DBE Company. TSL is judicially recognized for forensic analysis and expert testimony services. TSL's forensic testing includes: controlled substances, toxicology, serological testing (no DNA), fingerprint, and handwriting analysis. TSL will evaluate any request of forensic cases, if found acceptable, experts will analyze the evidence and testify anywhere in the U.S.
TSL's environmental department is currently certified by the State of Ohio to conduct some tests on drinking water. E.C.Labs, a division of TSL located in the Cleveland area is certified by the New York health department to analyze wastewater, hazardous materials in accordance with NELAC requirements. Tri-State Labs, Inc. is located at 2870 Salt-Springs Road Exit 226 of I-80 which is a convenient location about 70 miles east of Cleveland and 70 miles west of Pittsburgh. Its location is also central about 400 miles from each of Chicago and New York City. COPYRIGHT © 2002. TRI-STATE LABORATORIES, INC. ALL RIGHTS RESERVED.